Lara fruit variety has a globular look; seen from the front it looks round, or short egg-shaped, with a round base and top; an oblong profile, very short, with a flat base slightly hollow and a little developed sting pistil shape. The two valves are strongly linked and the suture edge between them is large but little developed. The shell is solid but can easily be broken, even by hand. The fruit is, on average, of large dimensions, with a diameter which is normally more than 30 mm; the average height is 34-39 mm, its medium diameter is 33-38 mm, the weight of dried walnuts ranges between 9 and 13 grams. Its kernel has a light colour, slightly amber-coloured and it is succulent, with a modest quantity of tannin and essence of “astringent” flavour. Its average yield, that is the ratio between the kernel (the edible part) and total weight of the fruit in its shell, ranges between 52 % and 55 %. Lara Fresh Walnuts are picked by Nogalba during the month of September close to harvesting after taking off their green hull and they are washed only with water and without subjecting them to any treatment (desiccation) in order to reduce their natural moisture which varies between 45% at the beginning of the period and 30% of end September. Because of their high content of water, fresh walnuts are kept in the fridge and eaten within a few days. Unlike traditional walnuts, Lara Fresh Walnuts can be enjoyed without having to take off the “skin” which covers the kernel, since their taste remains, in any case, fresh and not bitter. The harvesting of walnuts destined to becoming Lara Dried Walnuts begins around the 10th-12th September and ends within the first ten days of October. The walnuts recently been picked are therefore shelled and washed with water alone, without the addition of any bleaching agent, and subsequently desiccated through a well-balanced process between temperature and flow of air, which brings the content of moisture of the whole walnuts to about 9-10% and the kernel’s to 5-6% Once such moisture has been reached, walnuts are subdivided by calibre and subjected to a strict selection in order to achieve Nogalba’s quality standard. Through the selection, walnuts with blemishes, mainly caused by the presence of insects, and wrinkling up (dry kernel) are identified and eliminated. The selection is first carried out mechanically, exposing walnuts to ventilation, which removes light/empty walnuts, and subsequently completed manually, walnut by walnut, by skilled staff. The outcome of the selection is constantly monitored by specially trained personnel, in order to guarantee the consumer with the declared quality. Why wasting time breaking walnuts? 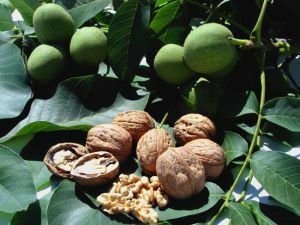 We can supply Lara Shelled Walnuts obtained in collaboration with the Cooperativa Agrivesuvio di Lauro in Naples. Walnuts broken mechanically are calibrated and winnowed (to remove pieces of shell from kernels), they are then put in an optical grader (to remove the shell and membranes as well as dividing kernels by quality and colour) and checked by hand to ensure the total absence of shell residuals, rotten membranes and kernels.